The Lincoln Independent Business Association, a member-organization comprised of more than 1,300 businesses, expresses its opposition to LB 1089. At the outset, we believe it important to acknowledge that as of January 1, 2016, Nebraska’s minimum wage for all employees is $9.00 per hour. Although employees who earn a portion of their wages from gratuities may be paid $2.13 an hour, state law requires businesses to make up the difference for workers whose tips fail to meet the $9.00 minimum wage threshold. In other words, by state law, all tipped workers already receive the minimum wage approved by Nebraska voters of $9.00 per hour. Furthermore, the proposed increase would more than double the hourly wage amount paid by employers to tipped employees. This means that employers will have to more than double their budgets for payroll expenses in less than a year’s time. A more than 100% increase in the direct payroll obligations of these businesses will have a major impact, and particularly on those who run smaller operations. LB 1089 also increases the burden on the business owner to pay increased payroll taxes. This is just a sample of the restaurants the Lincoln economy saw shut their doors in 2015. In 2014, Lincoln saw a total of 36 restaurants close. The restaurant business is a tough one in which to find success, and this bill will make it even more difficult. We visited with a Lincoln restaurant owner who owns six Lincoln locations. He provided us with a spreadsheet that I have distributed for your reference. Among the six locations, this owner has calculated that it will cost his business $154,590 a year in additional wages if you pass this bill. This $154,590 cost will inevitably passed on to customers through price increases, or will result in staff being reduced. The figure also does not include additional costs or payroll taxes to the state or federal government. 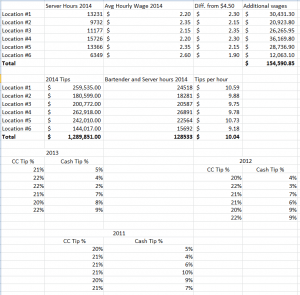 The owner further notes that in 2014 his bartenders and wait staff reported $1,289,851 in tips earned for the year. Their reported tips averaged just over $10.00 per hour. Considering the figures provided, the problem, in our opinion, may not be that workers are underpaid by their employer. Instead, it appears that workers may not be fully reporting cash tips earned. Notably, at one location, restaurant staff reported average tips from customers paying with a credit card equaling 22% of their total ticket. Workers at the same location, however, reported only receiving 2% in tips when customers paid in cash. 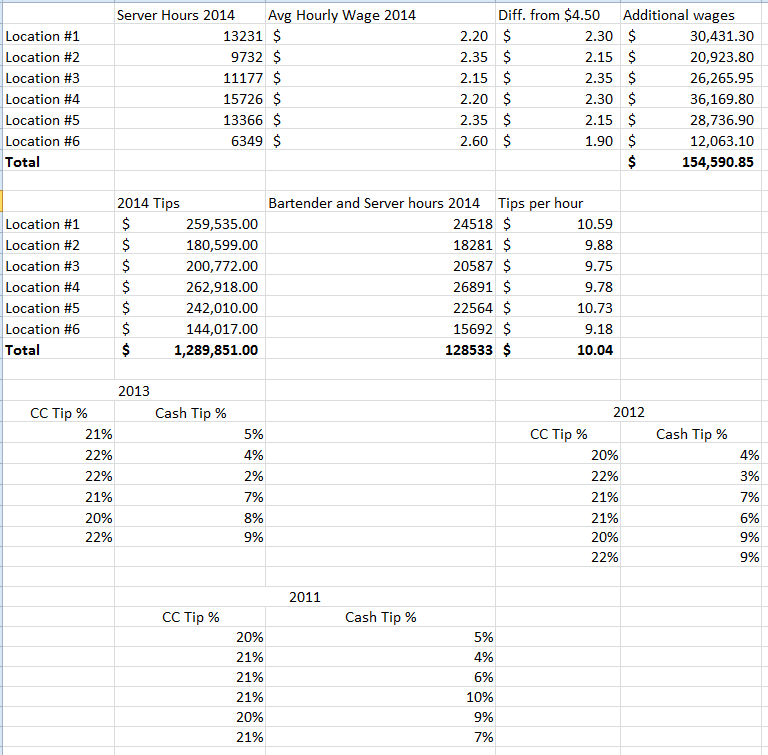 Other locations reported averaged only 4% to 9% tip values from cash-paying customers. It is difficult to believe that customers paying with cash actually provide an average of 2% in tips. We suspect that there are issues with the underreporting of cash tips, and fear that the increased payroll burden on employers outweighs any purported need for an increase in the tipped minimum wage. Service workers who rely on tips deserve sufficient wages. Tipped employees are guaranteed to receive the minimum wages approved by Nebraska voters. For these reasons, we ask that you oppose LB 1089.